Over the last 20 years, EKNOW has developed the only true, real-time, object oriented development platform for M&A solutions. More like an M&A operating system than an application, the EKNOW core technology framework is what makes M&A Tools fundamentally future-proof: far more flexible, extensible, reliable, and capable than any other M&A platform, at any price, from any vendor. EKNOW’s strong claim is that the M&A Tools platform is inherently more robust, flexible, secure and accessible than any other dedicated M&A solution. The reason for this fact is architectural. Though the EKNOW server application is written in JAVA, the M&A Tools product is not written directly in Java. In effect, EKNOW has developed an M&A system language (“M&A Objects”) in JAVA, and built the M&A Tools product in M&A Objects. The simple looking M&A Tools tool bar is just as easy to learn as it appears. But its simplicity conceals sophisticated automation. The Tool Navigator automatically presents or conceals a logical flow of M&A Tools navigation elements (modules, tabs and more). Every navigation option is intelligently presented, or not, based on user role, deal or project, and other critical context. 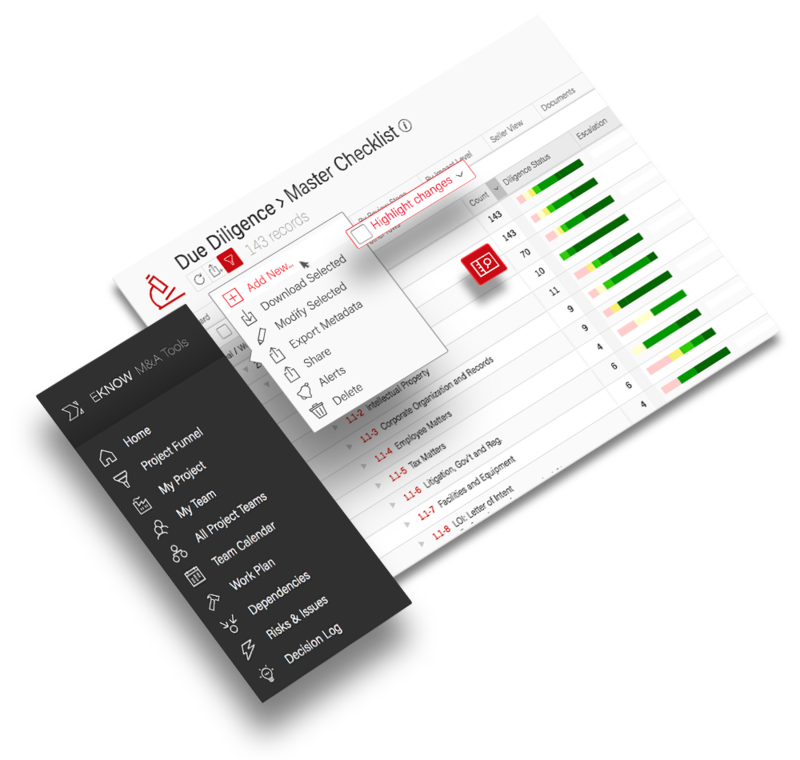 These features of Tool Navigator’s intelligence ensures maximum user uptake, ease of use, and user relevance. Since the Tool Navigator is built entirely in EKNOW merger and acquisitions operating software, every client or partner modification, extension, or custom module, can instantly acquire the same intelligence. 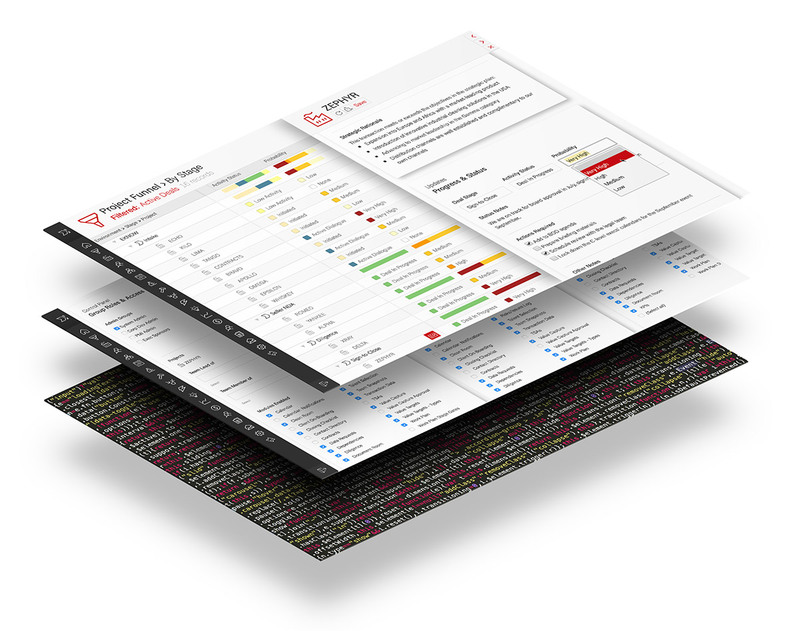 Part of M&A Tools’ depth comes from the dozens of available Modules. New modules are added each year, to address almost any client profile and deal type. But since every M&A Tools Module is built in EKNOW ToolBuilder and Navigator, Modules automatically appear only if enabled by the client, and only when appropriate to the user, deal, and context. This also means that every Module inherits the same EKNOW UI user interface capabilities and norms. Every past, present, future, modified, or fully custom module is on the same footing: Each is as professional looking and as easy to learn. Each Module is individually controllable via the EKNOW ACF access control framework. And every Module can take full advantage of the M&A Tools’ reporting, charting and analytics, alerts, discussions, and much more. Every EKNOW M&A Tools Module addresses a unique business requirement. 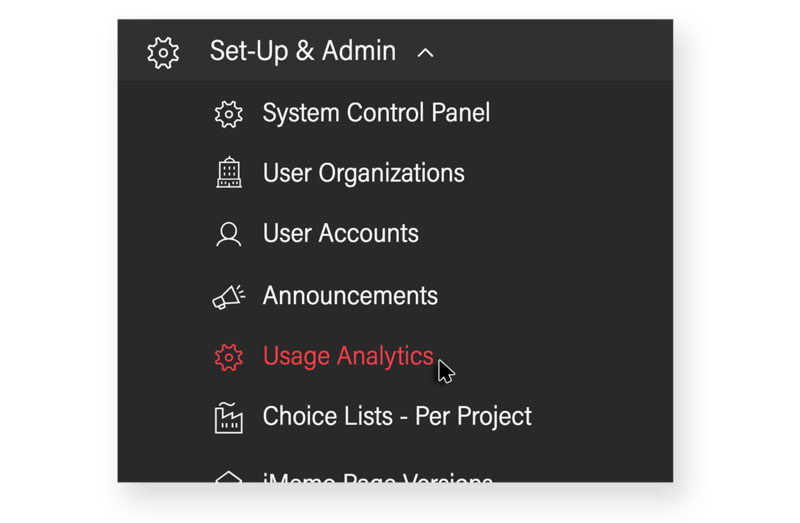 Yet each new module seems familiar to users: Filtering works the same way, even when specific options are different. Adding and modifying workflow items, tracking changes, etc., work similarly. These are the automatic benefits of another ToolBuilder core technology, the EKNOW UI (User Interface) Language. Users easily learn the EKNOW UI conventions from the first module used. Users can then learn any new tool quickly, and apply new techniques in many contexts. Client organizations and consulting partners further benefit: The entire user experience has a highly professional, polished appearance, which reflects well on the employer or consulting partner. New or tailored modules can be deployed more quickly and with low risk. Training requirements are reduced or eliminated. Most improvements to EKNOW UI automatically apply throughout the platform, from core modules to even fully custom modules. What should a deal lead be able to see? What about her colleagues in a different business unit? In the diligence team? The integration teams? The clean team? What about external users? What about external users representing the seller? What about those same users – after close? EKNOW has encapsulated almost endless access permutations in an access configuration language, called EKNOW ACF. ACF is what ensures that users can see or edit all but only the data they should see. Because ACF mirrors the professional roles and relationships of the real world, access can be controlled automatically. There is no administrative need to manage access to individual items. ACF allows administrators to easily make targeted access exceptions, while providing guardrails against human error. But no two client organizations are identical. Eventually a new category of user and access is required. 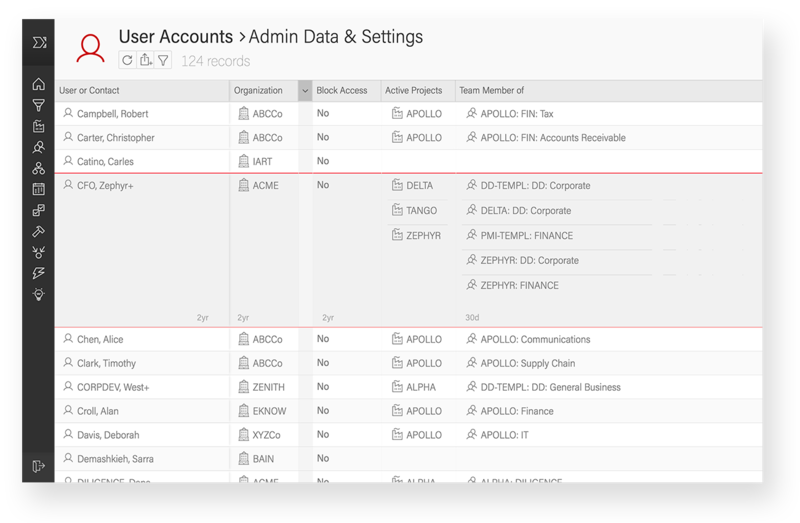 As a framework built on ToolBuilder, ACF enables real-time changes to your access control policies when absolutely needed, with no interruption in your business process. EKNOW ToolBuilder is a true minor miracle. 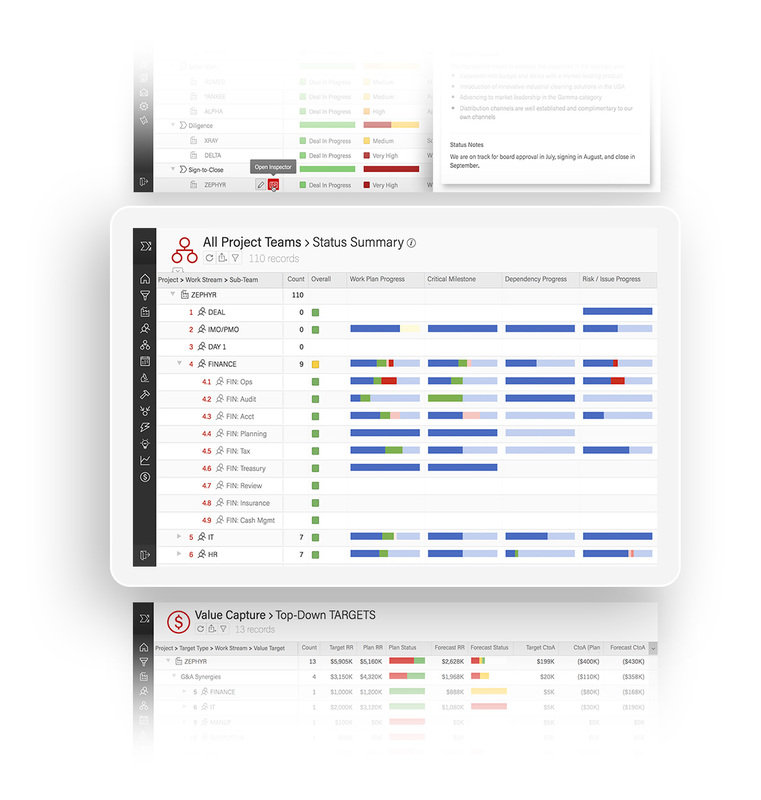 ToolBuilder allows EKNOW and partners to implement, reimplement, modify, or extend all of the capabilities above, in real-time. By real-time we mean: without recompiling, without writing a line of code, without interrupting users, on a running system. This is possible because EKNOW ToolBuilder is simultaneously a deployment platform, high-level development environment, object oriented database, and UI generator. This makes EKNOW M&A Tools rare among software of any kind, and unique among M&A platforms. 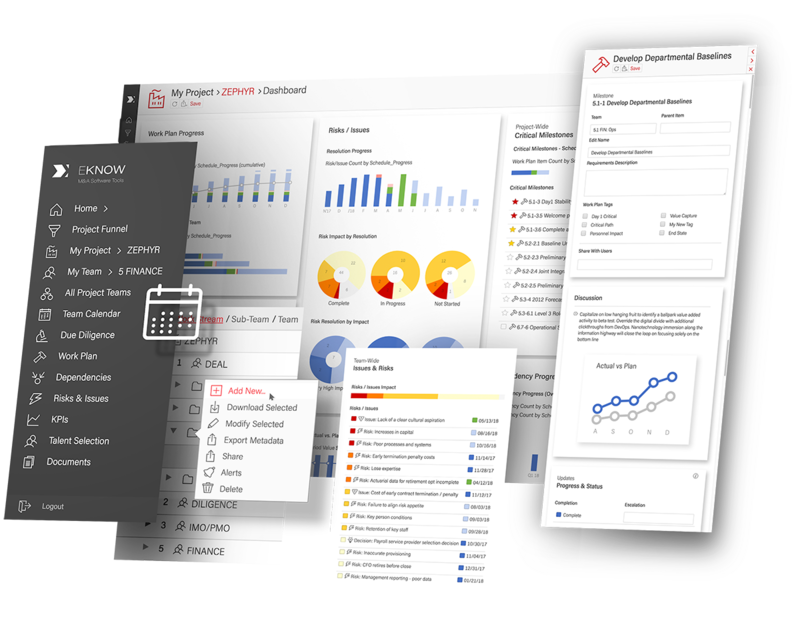 But more important for EKNOW customers and partners: The complete EKNOW ToolBuilder framework has been developed and optimized entirely for M&A and transformation initiatives. Today, entire new modules of M&A Tools are developed only in EKNOW ToolBuilder. Faster than possible on other platforms, because the modules themselves are developed without writing a line of code. Code-level software engineering at EKNOW is primarily dedicated to extending ToolBuilder capabilities, rather than specific applications of ToolBuilder. This is why EKNOW ToolBuilder is the crown jewel of EKNOW. Developed and continuously improved over the last 20 years, ToolBuilder is at least 10 years ahead of the competition and becoming more powerful with each release.